Odyssey Chamber Music Series right to the doorsteps of the Lenoir Woods community. 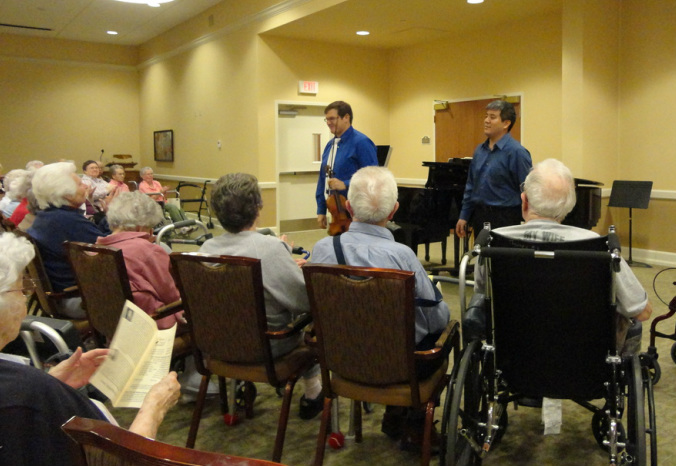 “Odyssey Music at Lenoir Woods” concerts are provided at no cost to the Lenoir Woods Lutheran Senior Services. A proponent of the music of our time, Mr. Yoo has premiered 71 works by 38 composers. With the Metamorphosen Chamber Orchestra, Mr. Yoo recorded Mark O'Connor's American Seasons for Sony Classical; John Harbison's chamber orchestra works with soprano Dawn Upshaw for Bridge Records, nominated for a National Public Radio Performance Today Award; and song cycles of Earl Kim with sopranos Benita Valente and Karol Bennett for New World, named a Critics Choice by the New York Times. Other recording projects include complete orchestral works of Earl Kim with the RTE National Orchestra of Ireland for Naxos; and works of Carter, Lieberson, and Ruders; and the cycle of Mozart Piano Concertos. As a violinist, Mr. Yoo has appeared as soloist with the Boston Symphony, Colorado Symphony, Dallas Symphony, Indianapolis Symphony, New World Symphony, San Francisco Symphony, and the Orchestra of St. Luke’s, among others. He has also made guest appearances with chamber music festivals throughout the United States, including Bargemusic, Boston Chamber Music Society, Chamber Music Society of Lincoln Center, Kingston Chamber Music Festival, Laurel Music Festival, New Hampshire Music Festival, and Seattle Chamber Music Festival. After beginning his musical studies at age three, he received First Prize in the 1988 Josef Gingold International Violin Competition, the 1989 Young Concert Artists International Auditions, and the 1994 Avery Fisher Career Grant. In 1993, Mr. Yoo founded the Metamorphosen Chamber Orchestra, conducting the ensemble in its subscription series at Jordan Hall in Boston and the Troy Savings Bank Music Hall in Troy, NY, and on tour at such venues as Avery Fisher Hall and the 92nd Street 'Y' in New York and the Library of Congress in Washington. The traditional music of Zimbabwe reveals the Shona people's spiritual beliefs, modes of expression, patterns of communication, and forms of entertainment. Our presentation today features repertoire from the Shona tradition on the mbira dzavadzimu accompanied by hosho, ngoma, and singing. Formed in 2014 as a collaboration between English Professor Anand Prahlad and Percussion Professor Megan Arns, the Chiyedza Mbira Ensemble consists of percussion students and faculty at the University of Missouri. Chiyedza has worked with Zimbabwean musicians Fradreck Mujuru, Patience Munjeri, and Musekiwa Chingodza, focusing on the treasured aural tradition of Shona mbira music. Two weekends ago, the group traveled to Indianapolis, Indiana to present a Daytime World Showcase Concert at the Percussive Arts Society International Convention with master Zimbabwean musician Musekiwa Chingodza. *This event was postponed due to an injury. Make-up date is June 21. * Second piano is generously loaned from the Jerry's Instrument Shop. Thanks to our partners who made Odyssey Festival possible! ​Formed in 2015, the Ivani Quartet currently studies in the Chamber Music Program at the New England Conservatory with renowned cellist Paul Katz. As the only all-female quartet at the New England Conservatory, the Ivani’s are very diverse, hailing from Korean-American, Hungarian-Russian, Japanese-Croatian, and Persian heritage. They were prizewinners in the 2016 International Chamber Music Foundation of New England Competition and have worked extensively with Nicholas Kitchen, Martha Katz, Kim Kashkashian and Soovin Kim. Recent performances include Ives' Second Quartet this past October, the first time the piece has been played in Jordan Hall in over ten years, John Heiss' "Microcosms" this February in Jordan Hall as part of the Composer Series concerts, and for the Philharmonie Quartet Berlin this past February. Sophia Anna Szokolay made her international debut in 2013, touring as soloist with the Győr Philharmonic Orchestra and giving solo recitals throughout Hungary. Since making her orchestral debut at 14, she has performed three times as soloist with the Toronto Sinfonietta as well as the Etobicoke Philharmonic, the Scarborough Symphony, Kitchener-Waterloo Chamber Orchestra, Toronto Symphony Youth Orchestra, Boston Philharmonic Youth Orchestra, and Academy Chamber Orchestra at the Royal Conservatory of Music in Toronto. An avid chamber musician, Sophia has performed with renowned musicians Martin Beaver, Johannes Moser, Jonathan Crow, Eric Nowlin, and members from the Dover and Parker Quartets. Sophia plays in the Ivani String Quartet in Boston, with whom she has worked with Paul Katz, Nick Kitchen, Ian Swensen, and John Heiss extensively on Ives' Quartet No. 2. Sophia began her violin studies at the age of 3. At 13 she became a pupil of David Zafer, Professor Emeritus of the University of Toronto and served as concertmaster of the Toronto Symphony Youth Orchestra from 2012-14. Sophia graduated from the Royal Conservatory of Music under the tutelage of Barry Shiffman and Victor Danchenko in 2015 and is currently pursuing a Bachelor Degree at the New England Conservatory, studying with renowned violinist and pedagogue Miriam Fried. Violinist Abigail Hong began her studies at the age of three with Amy J. Lee and Soovin Kim. A native of Philadelphia, Abigail went to the Temple Boyer School of Music Preparatory as a Starling Scholarship Recipient at the age of eight and also made her debut at Carnegie Hall in Weill Recital Hall after being a prizewinner at the New York Music Competition for YWCA. She has performed with the Charlotte Symphony Orchestra, Black Pearl Orchestra, and the Ambler Symphony this past 2015-2016 season. As an avid chamber musician, she has played throughout the east and west coasts for audiences in New York, Vermont, California, New Hampshire, North Carolina, and abroad in France, Spain, and Denmark. This past summer, Abigail performed works by Peter Lieberson, Kurtag, and Beethoven throughout Denmark, collaborating with members of the Emerson Quartet and Steven Dann. She has studied with Ying Fu, Jessica Lee, Yayoi Numuzawa and her primary chamber coaches have been Vivian Hornik Weilerstein and Paul Katz. Abigail attended YellowBarn, Music@Menlo Chamber Music Festival, Pablo Casals Festival, New Music for Strings Royal Academy, Meadowmount School of Music, Killington Music Festival. Ms. Hong has performed regularly as a member of Symphony in C, Boston Philharmonic Orchestra, New York String Orchestra Seminar, Philadelphia Youth Orchestra, and the Gail W. Snitzer Quartet as an Advanced Study Scholarship recipient of the Settlement School of Music. Abigail Hong is pursuing her Bachelor’s degree at the New England Conservatory under the tutelage of Soovin Kim. She currently plays a Jean-Baptiste Vuillaume on generous loan to her through the Dorothy Bales Foundation. Classical violist, and North Carolina native, Aria Cheregosha, has much experience in her craft, which comes in many different varieties. Although given a musical name at birth, she was not born into an exceptionally musical family, however, she showed a strong interest in music at a young age. Since picking up the viola at age seven, the twenty-one year old has accomplished quite an acceptable amount for her age. She currently attends the New England Conservatory of music in Boston, MA, studying under the brilliant teacher and world-renowned performer, Kim Kashkashian. Aria also currently holds a principal viola position with the Boston Youth Philharmonic Orchestra. In previous years, Aria has competed in, and placed high, in several state and international competitions. In June 2012, Aria performed in Hatch Recital Hall at the Eastman School of Music as the youngest semi-finalist for the 2012 Young Artist Competition of the prestigious International Viola Congress. In addition to being a solo musician, Aria is also an experienced chamber musician, in which she has performed numerous times at Carnegie Hall and also at the John F. Kennedy Center for the Performing Arts. Most recently, she is the violist of the Ivani String Quartet while completing her studies at NEC and has performed in NEC’s Jordan Hall with her chamber groups on multiple occasions. Aria prides herself in striving to shine a more soloistic and virtuosic light on the viola. She looks to be innovative and modern with her approach, while still respecting and honoring past traditions. Sharing the classical beauty and richness of the viola with her audience, while taking it to new heights and testing its limits, continues to be her goal and hopes that her passion and excitement also enlightens and touches her audiences for many years to come. An avid chamber musician, Annette Jakovcic spent many summers playing chamber music at festivals such as the Castleman Quartet Program, Yellow Barn Young Artist Program, and was a Jack Dietrich fellow at the Madeline Island Chamber Music Program. She has worked with members of the Cleveland, Borromeo, Brentano, and Pacifica Quartets. She is currently a member of the Ivani Quartet. Internationally, Annette participated in festivals and masterclasses such as the Casals Festival in France, and has performed in Korea, Japan, Austria, Italy, and Croatia. Annette previously studied with Wendy Warner at the Columbus State University's Schwob School of Music as a dual-enrollment student. She is currently pursuing her Bachelors Degree at the New England Conservatory where she studies with Laurence Lesser. Music of violin and piano, themed around Paris and Love to celebrate the Valentine's Day! M-Odyssey: Odyssey Performance Fellows in "Crossroads"
* Artists & programs are subject to change without notice. Kids@Heart - A Children's Concert: "Dance Music"
Samuel Barber (1910-1981): From Souvenirs (1952), "Waltz"
A reception following the concert is sponsored by the Lenoir Woods Senior Living. The Deciduous Trio was formed in the summer of 2012 during the Texas Music Festival. Ms. Cowan, is a current graduate student at the Shepherd School of Music at Rice University, and Ms. Strange, and Ms. Mientka are recent masters graduates. 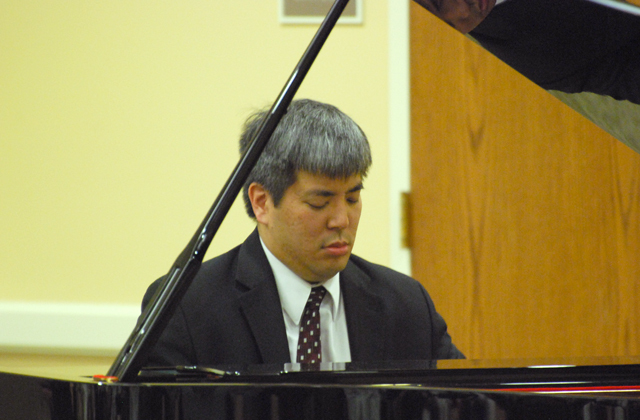 At the Shepherd School, the trio participated in several chamber music recitals, and master classes. After being together for only a year, in April 2014 the Deciduous Trio were semi-finalists for the Coltman Chamber Music Competition in Austin, TX. In addition, they were offered a two week chamber music residency at Avaloch Farm Institute in New Hampshire in August 2014. While at Avaloch, they rehearsed daily to learn new repertoire, performed several concerts, participated in community outreach, and also recorded a demo CD at a local recording studio. In the fall, they were featured artists on the Western Slope Concert Series in Colorado. This gave them the opportunity to share their music with the communities of Grand Junction and Montrose and give a masterclass at Colorado Mesa University. As an emerging chamber group, the Deciduous Trio is committed to exploring and expanding the repertoire for their ensemble. Ms. Strange and Ms. Cowan are also active individual freelance musicians in the Houston area, and Ms. Mientka recently relocated to the Denver area to play in the Boulder and Colorado Springs Philharmonic orchestras. "Prokofiev Sonata for Two Violins & Chopin Concerto No. 2"
"Schumann Liederkreis & Chopin Concerto No. 1"
Mozart Violin Sonata in B-flat Major, KV454 will be performed in its place. Special thanks to Dr. Edward and Mrs. Judith Chmielewski for their vision and generosity. Odyssey Season 9 was generously sponsored by Comfort Suites in Columbia. Hear the preview of Odyssey Season 9 at Lenoir! with MU professors, flutist Alice K. Dade and pianist Peter Miyamoto. May 15, 2012 with Erik Hassell, violin and Peter Miyamoto, piano, after the second "Odyssey Music @ Lenoir Woods" concert of the series. Ludwig van Beethoven (1770-1827): Sonata in C-sharp Minor, Op. 27, No. 2 "Moonlight"
April 9, 2012 Peter Miyamoto performs a solo work at the inaugural concert of Odyssey Music @ Lenoir Woods.